Jagannatha Snana-Yatra - Sunday, June 29, 2014 ~ The Toronto Hare Krishna Temple! A sure sign that the annual Festival of India (Ratha-Yatra) is just around the corner (July 12-13, 2014) is the annual Jagannatha Snana-Yatra festival! Snana-Yatra, a wonderful festival, wherein Lord Jagannatha, Lord Balarama and Lady Subhadra will be bathed amidst amazing kirtan and chanting! The bathing ceremony will tentatively take place from 6:45-8:00pm. Please note that Lord Jagannatha's altar will not be open for the 8:00pm Arati. After the bathing ceremony (Snana-Yatra), Lord Jagannātha apparently becomes sick. He is therefore removed to His private quarters, where no one can see Him. Actually, during this period the body of the Jagannātha Deity is repainted, this is called nava-yauvana. 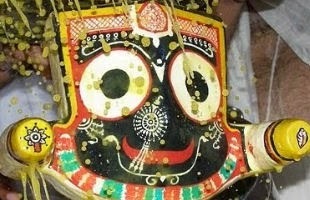 During the Ratha-Yatra Festival on July 12th, Lord Jagannātha will once again come before the public. Thus for thirteen days after the bathing ceremony, Lord Jagannātha is not visible to any visitors! Don't miss out this last opportunity to see Lord Jagannatha before his grand Ratha-Yatra festival!